I'm featuring this car "just because"... Just because I used to own one. Just because you see so few around these days. Just because it's cheap. I did a full post on a Fuego back in November, 2009. You can find it here. Everything I wrote about that car holds true for this one, except for one thing... This one is a turbo. Back in the 1980s Renault was at the forefront of turbo technology. Still, that was 30 years ago and the Fuego Turbo is definitely old-school... Start the car, put it in gear, watch the boost gauge, wait for all hell (and sometimes the front end) to break loose. Turbo lag can be like a roller-coaster; fun and scary at the same time. This 1983 Fuego Turbo needs work. The biggest problem is a blown head gasket. 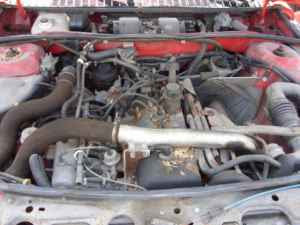 (This was somewhat common on the Fuego Turbo as things got very, very hot inside the engine compartment of US spec cars.) The body has a dented quarter panel and a few good sized dings but, according to the seller, no rust. The seller say the car has 24,800 miles on it and has not been started in 20 years. Plan on doing much more than a little bodywork and replacing the head gasket. The asking price for the Fuego is $1100.00. 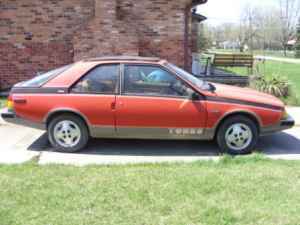 In the end, if you can do much of the work yourself, you'll wind up with a cool looking, fun to drive, rare car for less than $5000.00. Located in Novi, MI, click here to see the Craigslist ad. Properly pronounced "fewgo" as most remain parked!